It’s bigger than it looks here. 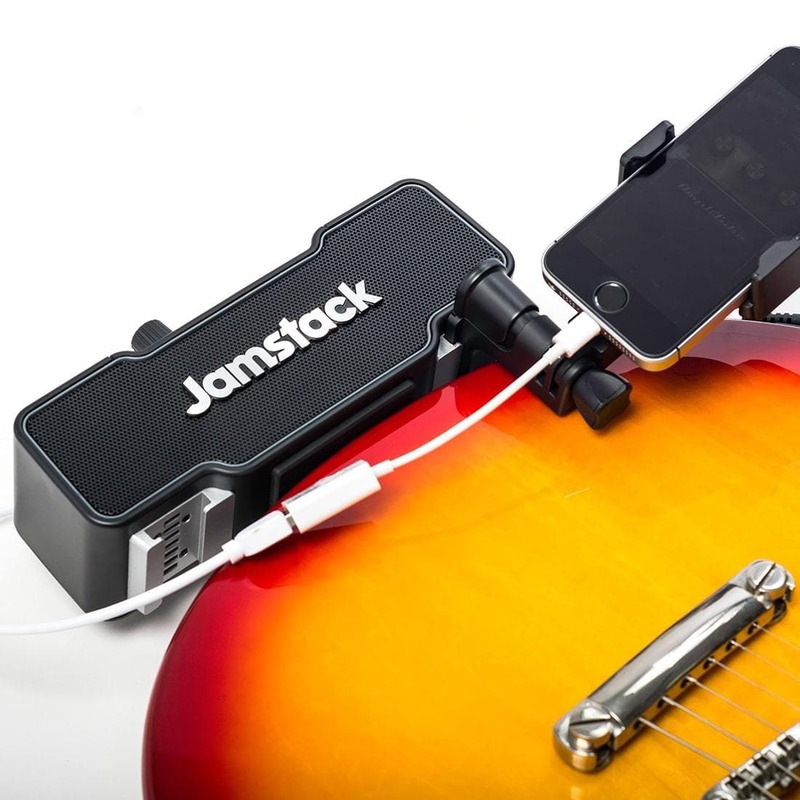 The $249 Jamstack is a Bluetooth speaker that clips onto your electric guitar, hooks up to your iPhone, and lets you run iOS amp simulation and effects apps. It’s like adding a teeny-tiny amp to your guitar, only with way more wires. For practice, it looks pretty neat — but for recording, it seems killer. There are no shortage of audio interfaces that work with iOS. Any USB “sound card” will do the trick with the correct adapter. But very few of these clip onto your guitar. And even fewer boast a built-in speaker. This combination of features means the Jamstack — not to be confused with the JamStik — may well be unique. The Jamstack clamps to your guitar. Even without a speaker, the interface/clip-on combo looks great. You can take the output of your guitar, and send it into the iPhone. You’ll need to run a cable to the iPhone (or iPad), but it’s a single cable, making it much less likely you’ll drag everything off the desk or sofa and onto the floor. Plus, there’s even an iPhone mount on there. It’s like the Jamstack’s maker thought of everything. The unit is bigger and heftier than I first thought when I saw it. The unit weighs in at 900 grams (1.9 pounds), and is the size of a Jambox-style speaker. With two speaker divers, it might actually sound pretty beefy. I also dig its physical connections. The guitar clamps are removable, connecting to the unit using camera-flash-style hot shoe mounts. That means it can also be mounted on other kinds of stands. Battery life runs up to eight hours. And the Jamstack also works as a regular Bluetooth speaker. 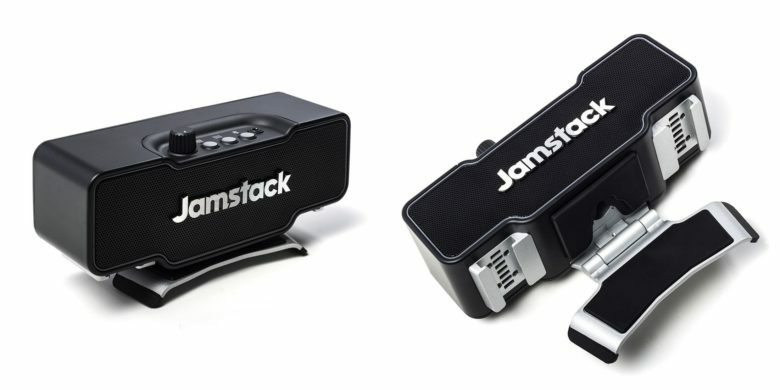 I started off a bit skeptical of the Jamstack, but the more I see of it, the more I like. If I was in the market for a portable, candybar-style speaker, I’d take a look at this. If it sounds as good as the competition, then why not get this instead? You’d get the added bonus of being able to play guitar on vacation, or to record yourself without having to bust out a whole desktop setup.